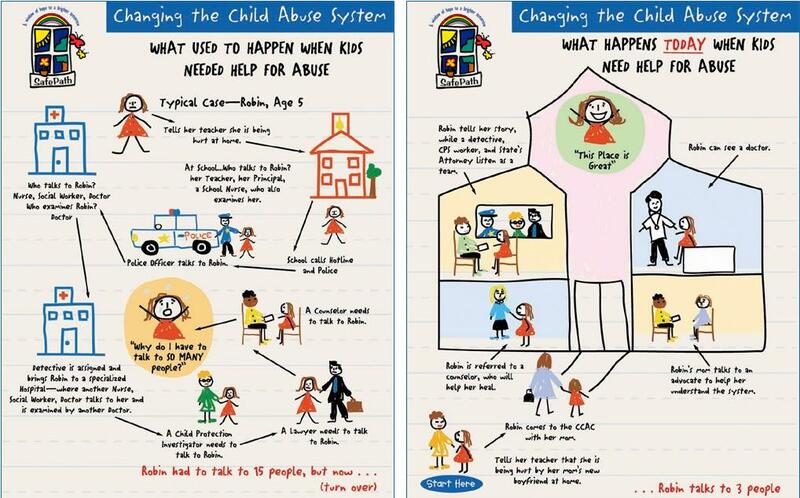 • If the child sees you are upset, explain you are upset with the abuser and it is not the child you are upset about. Report the abuse immediately, call 1-800-649-5285. After a child has revealed abuse, you may be shocked, confused and/or angry. Regardless of what you are feeling or thinking, it is important to respond to the child appropriately. • Remember that the child is a child, and treat her as such. Don’t expect your child to respond like an adult. • Be supportive of the child, but do not treat them differently. • Keep to your regular routine as much as possible. • Children often feel a sense of relief after disclosing abuse. Support from the parent or caregiver is one of the most important factors in your child’s healing process. By offering support, you play an important role in the child’s mental and emotional health. • Acknowledge any feelings of anger, guilt, frustration, sadness, etc. that the child may experience. Let the child know it is okay to feel anything. Teach appropriate ways to express feelings. • Be aware of your own reactions and get support and help as you work through your own feelings. • Don’t discuss the abuse with others in your child’s presence. Anyone can report suspected abuse. Call 1-800-649-5285. If a child is in immediate danger call 9-1-1 or your local police first. Then call the 800# above to report it to the Department for Children and Families. In some cases, ask you to gather more information. What if I’m not sure whether what I suspect is abuse? Please call us for advice. You may also want to seek our advice if you are thinking about telling the parents that you made a report. In some cases, this could endanger the child and hinder any subsequent intervention. A supervisor evaluates each report to decide whether to accept it for intervention. If your report is accepted, the child will be interviewed in a child friendly environment by a forensic interviewer that is specially trained to interview children in cases of abuse. Click here to learn more about the Forensic Interview process.